1. Preheat the oven to 170°C / 338°F. 2. Grease baking tray or line it with parchment paper. 3. For the base: Put the flour, sugar, salt, butter and lemon zest and using a handheld electric whisk (or a freestanding electric mixer), beat until the mixture resembles breadcrumbs. Press the dough evenly into the base of the prepared baking tray. Bake in the preheated oven for about 20 minutes, or until light golden brown. Leaving the oven on, leave the crust to cool slightly. 4. Put the sugar, eggs, lemon juice and zest in a bowl and whisk until well-mixed. Pour carefully over the baked base and return to the oven. Bake for 20 minutes or until the edges are golden brown and the topping has set in. 5. Leave to cool completely and dust with icing sugar before serving. 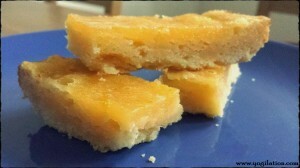 Alternatively, you could cover the lemon bars and refrigerate it overnight before cutting them up into individual bars. A big THANK YOU to °Franzi~ for the recipe!